In the following, I have linked to products from my affiliate partners that I personally use and recommend. 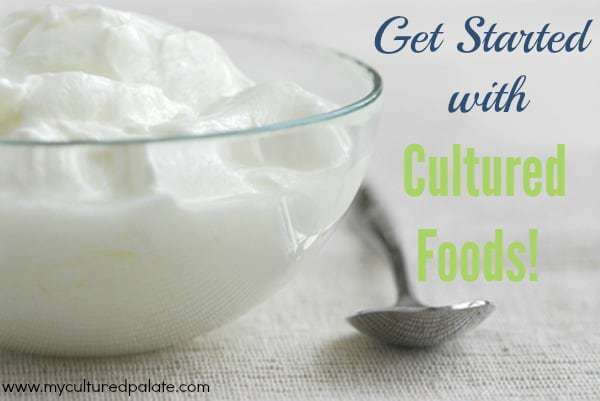 Do you get overwhelmed as you look through recipes for cultured or fermented foods? Wonder where to start? You probably know by now how good fermented foods are for you – your gut needs the beneficial bacteria that these foods provide. Yes, you can take a probiotic pill but many of them do not make it through the stomach and into the intestines! That’s right, they get digested in the stomach leaving your gut lacking the benefits! It can be scary when starting something new. But, how many times have you started something new and then wondered why you didn’t do it sooner? I know it is overwhelming when there are so many great recipes to try but why not start with something simple that I am sure your family will love! None of these require a lot of time or fancy equipment. Don’t worry about messing them, up just give them a try and I know you will be surprised at the results. Everyone is familiar with sour cream so, right from the start, there is a sense of comfort. Top a baked potato or try a healthy dollop in your soup. To make sour cream you can purchase the ingredients at your local grocery store. You need heavy cream and cultured buttermilk (this contains the live cultures). Using a pint jar, pour the heavy cream into the jar and add 2 Tbsp of cultured buttermilk. Put the lid on, shake well and then loosen the lid slightly. Leave the jar on your counter for 12 – 24 hours – until the sour cream is thick and creamy. That is the easiest way to begin making your own sour cream. Once you see how easy it is, you may want to get starter culture and try an even thicker and creamier tasting sour cream. The directions are including in the packet. Kefir is like yogurt on steroids when it comes to the probiotics in it! While yogurt may have 5 – 7 strains of beneficial bacteria in it, kefir can have 50+ in it! Another difference between yogurt and kefir is the taste. Kefir is much tangier than yogurt. So, you may need to get use to the taste. The tang can be controlled to some degree by the amount of time the kefir grains are left in the milk – the longer the grains are left in the milk, the tangier the kefir tastes. Basically, the process involves putting kefir grains in a glass jar, adding milk and leaving them on your counter for 24 hours. Then, strain the kefir (catching the grains), place the grains in a clean jar and refill with milk. In Homemade Kefir, I give the recipe for making kefir and you can even watch the Making Kefir Video if it helps to watch someone actually go through the process. To find kefir grains, click here. My children love carrots and fermented carrots are even more special. They make a great side dish to any meal or a quick snack. I have started using baby carrots instead of cutting up large carrots when I am pushed for time. I use a 1/2 gallon wide mouth jar (a quart works too! ), fill with carrots and add whey or a starter culture, leave on the counter for 2 -3 days with the lid on and they are ready to eat! How easy is that? You can find the detailed recipe here.